New York City is enjoying another building boom. During 2018 and 2019, some experts predict that annual construction spending will top $50 billion. The borough of Queens regularly secures a large percentage of the city’s annual construction permits. While all this work lasts, as many as 140,000 construction workers may be employed throughout NYC’s five boroughs. With the rise of development in Queens, construction accidents are also on the rise with construction workers’ safety in danger. A construction accident may involve a fall from a ladder or scaffold. A worker may also be struck by a falling object which is part of the construction job. During recent years, Queens construction sites have stayed busy erecting multiple skyscrapers and handling demolition projects and building alterations. Potential dangers always exist since construction projects require many different types of heavy earth-moving equipment including excavators, bulldozers, tractors, loaders, trenchers, graders, scrapers and compactors. And safety guidelines must also be closely followed when explosives are being used for many demolition projects. In addition, dump trucks are often required to remove excess earth and rocks from building sites. Each day, cranes must also be regularly brought in to help move critical building materials like lumber and steel beams to different locations – and to lift heavy workers’ tools and large pieces of equipment to where they belong. Forklifts are also needed to carefully move smaller loads around work sites. All these activities create numerous safety hazards for even highly skilled construction workers. The following material looks at several recent Queens construction accidents and notes the most common types of injuries annually suffered by construction workers. Additional data looks at the most frequent OSHA (Occupational Safety and Health Administration) construction safety violations. Finally, various suggestions for improving construction site safety are also reviewed. Back in November of 2016 two other Queens construction workers were killed. This apartment complex accident occurred in the Briarwood neighborhood. A crane operator was helping a worker move a steel beam weighing 6500 pounds when the beam shifted, striking the crane’s cab – causing the death of the operator. The beam then fell on top of a worker on the ground below, killing him. When the accident took place, some witnesses thought that high winds may have played a role. The crane had just passed inspection less than six months earlier. Those two accidents reveal how many workers are regularly injured or killed by heavy falling debris and poorly maneuvered forklifts. OSHA regularly monitors the number of specific workplace injuries in many industries – including those suffered by construction workers. While staying on top of the numbers for the four most common types of construction site injuries and deaths (see below), government officials also provide construction site inspections and require appropriate training programs in hopes of decreasing worker injuries and deaths. Stated simply, the “Fatal Four” designation refers to the main types of accidents that annually cause construction worker deaths. They are best described by the following events and activities. A wide variety of other workplace activities cause all the remaining annual deaths. Given the frequency and severity of these construction site accidents, a higher priority must be placed on ongoing safety training. Various construction industry groups have recently shared some of the following ideas in hopes of maximizing worker safety. Always welcome reports about workplace dangers. When employers punish workers for reporting their concerns, they not only violate federal laws – they also greatly increase the chances that workers will suffer needless injuries and deaths. Injuries to construction workers on the job will qualify them for worker’s compensation insurance benefits. A worker’s employer will often have worker’s comp coverage which will pay for an injured worker’s medical bills and lost wages. However, an injured worker cannot sue his employer directly which is known as the worker’s comp bar. In many situations, the worker can sue a third party such as the landlord or owner of the construction site where he was injured. Since the Labor Law puts liability on the owner and the general contractor of a construction site, an injured worker can recover against these defendants. When someone is injured at a construction site, often the injury is serious and medical care is the most important pressing issue on the worker’s mind. At F&A Construction Accident Lawyers, we coordinate our client’s medical care with some of the best doctors in the United States in varying specialties including neurology, orthopedics, pain management, and surgery. Our firm works closely with a client’s worker’s compensation attorney to confirm the worker’s comp case and the third party lawsuit are being correctly built up together. 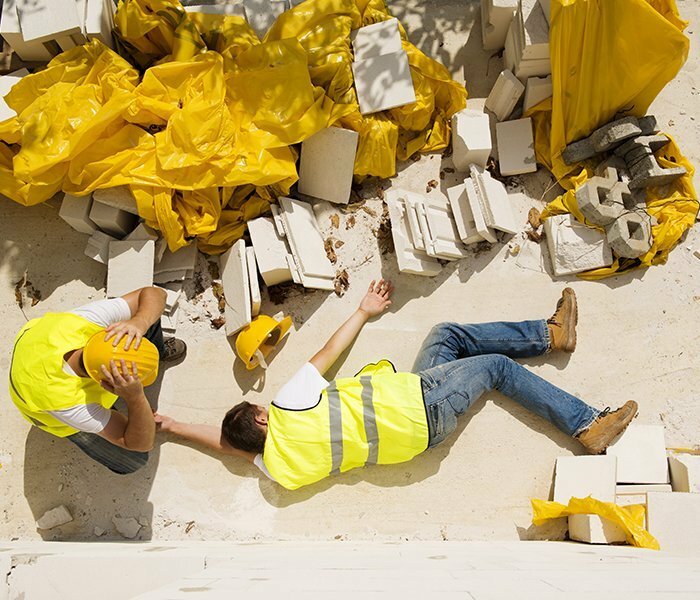 If you or someone you know was injured at a construction site, contact the Queens construction accident lawyers at F&A toll free at (866) ATTY LAW. Call our local number (212) 222 – 1111 or fill out the contact form on our website.